ANYWAY, IT'S STARTING TO BLOOM IN JAKARTA. 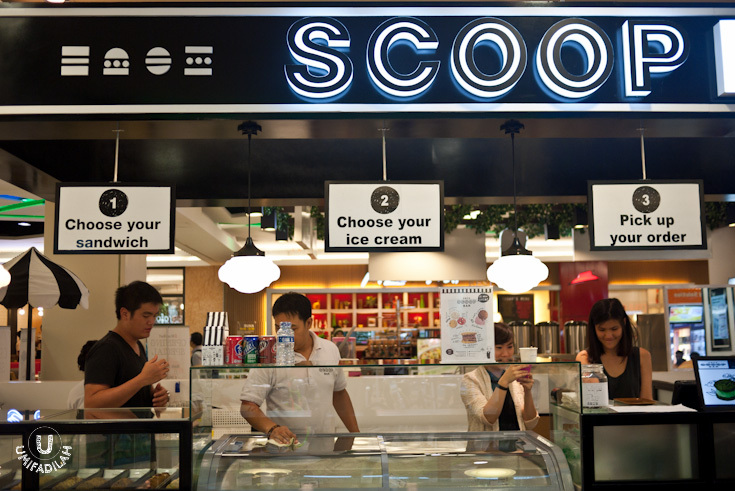 Scoop bar, claiming to be the first Ice Cream Sandwich bar in town, opened in early August 2013 at one of the new hippest mall Kota Kasablanka, Lower Ground. The owners are four incredibly friendly people, 2 of them had spent few years living in Australia, and the other two in the United States. Thanks to Ronald, Jacqueline, Edward and Sabrina for bringing the new concept with a fun and playful shop décor (hey, hats off to their Doodle Artist!). Scoop Bar occupies quite a small space but they’re leveraging it to the maximum usage of bar stools and high counter tops to fit more people and also to resemble its name. 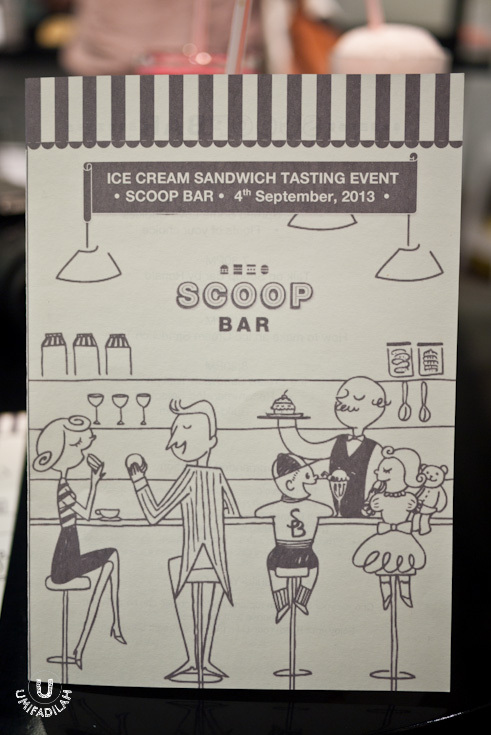 With dominant black & white doodles and bold contrast signage, the place begs an eye from every passing window-shoppers. Vanilla, Chocolate, Mocha, Rum Raisin, Cookies & Cream, Matcha, Java Chip, Banana, Frambozen and Strawberry. Peanut butter cookies with chocolate scoop. 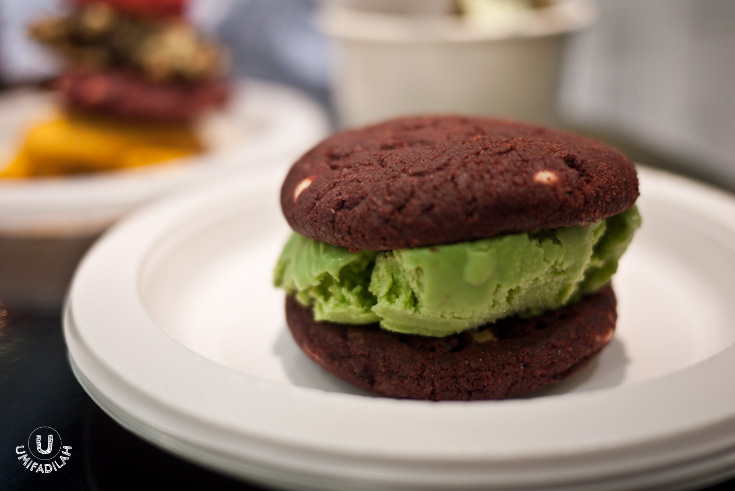 Red Velvet Cookies with Matcha Ice Cream. My Favorite? Seriously, the classic the better. But I really enjoy the Peanut Butter flavor and the S'mores with the tiny marshmallows on top. 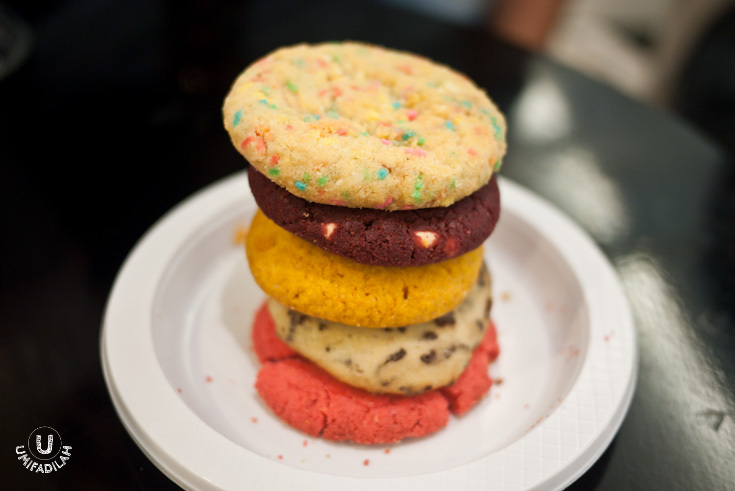 These are the kinds of cookie I'd love to chew every single day. Not too sweet, but moist, flaky and crumbly. It's already great without the ice cream! 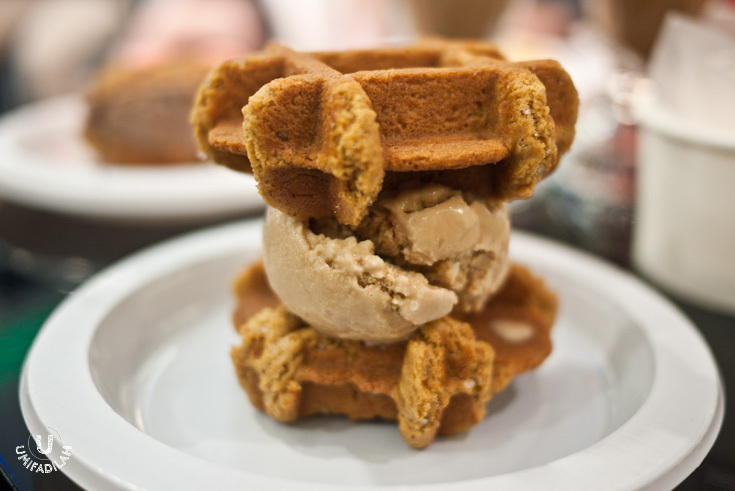 And I don't quite dig the Waffle cookie because it has a more 'sturdy' texture that made it harder to bite. Other than that, the fancy flavor such as Fun Confetti, Almost Red Velvet and Matcha - naahh :| Simply too adventurous for me. Nutella cookie is great though, you know, because IT'S NUTELLA. I honestly couldn’t even finish quarter of my drinks. No, in fact, I hate soda floats. The thought of soda creeps me let alone adding a scoop of ice cream, everything’s just way too much sugary sweet. It’d be a better deal if they’re giving out free mineral water for every BYO Sandwich purchased, because after having so many sweets I suppose people would prefer a normal, soothing drink. It was quite a fun thing to do especially if you’re a sweet-tooth type of person. 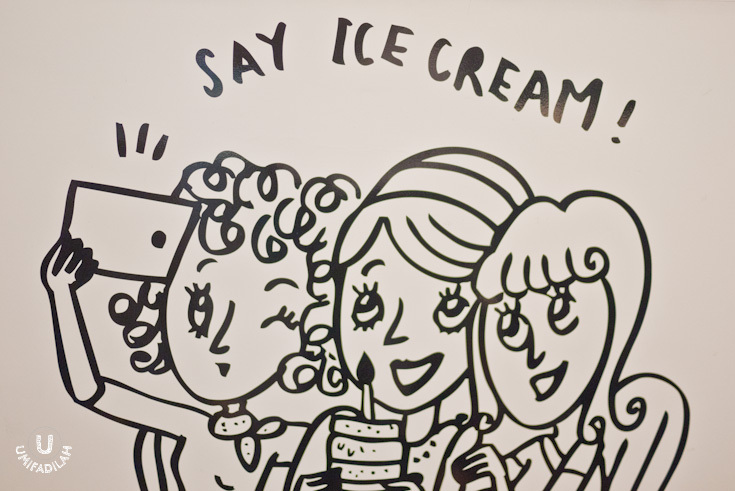 And don’t let photo size fools you – eating 1 ice cream sandwich alone is fulfilling enough. (Although later it made me crave something else savory so badly, lol). Whether or not it’s going to become the next “it” thing, let’s see in couple of few upcoming months. As far as the current hype goes, some other established brands such as GOODS Dept is already starting to introduce their version of Ice Cream Sandwich too. Give it a try when you’re around the area and looking for some dessert time or even snacks-to-go. 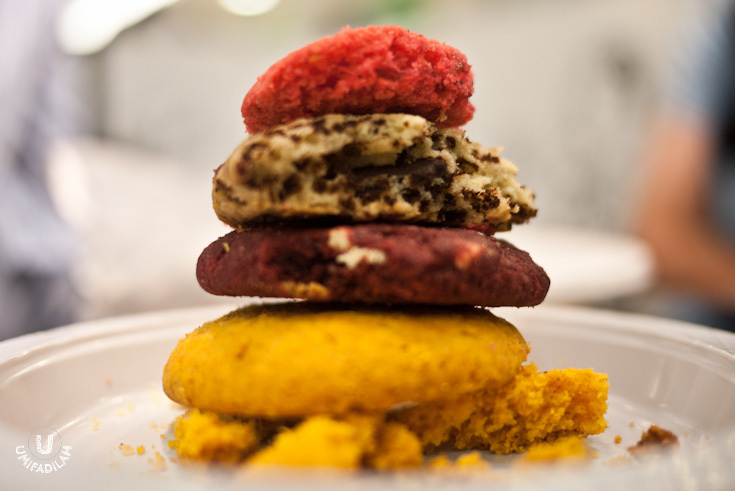 You can also buy the cookies only – 1 bag of 5 cookies: IDR 35,000; and 3 bags for IDR 100,000. I hope you had fun mix-&-match-ing!